LONDON, UK: 9 MAY 2012 – HRH The Princess Royal (Princess Anne) tonight presented a Whitley Award for inspirational conservation leadership to Josia Razafindramanana of Madagascar for her work to protect a rare lemur recently found living at scattered sites in the island’s central highlands. 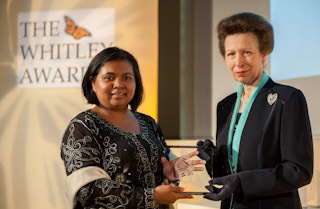 Josia, 28, of the Malagasy Primate Working Group received the honour during a ceremony at the Royal Geographical Society in London, hosted by Whitley Fund for Nature (WFN) – the UK-based charity which organises the international awards scheme. Her Whitley Award comprises a project grant of £30,000 – donated by The LJC Fund, in memory of Anthea and Lindsey Turner – an engraved trophy, membership of the influential network of past Whitley Award winners and career development training. The award recognises Josia’s efforts to build a better future for one of the most elusive of Madagascar’s unique lemurs – the crowned sifaka – while also improving living standards for the communities who share its home amid fragments of forest. The same ceremony also saw Dr Rodrigo Medellin of Mexico become the first-ever recipient of the newly-created Whitley Gold Award for outstanding achievement and project funding of £30,000, donated by The Friends of Whitley Fund for Nature. His award recognises the globally-significant contribution he has made to bat conservation since his success in WFN’s leadership grants scheme in 2004. In addition, Her Royal Highness presented six other conservationists with £30,000 Whitley Awards for leadership, bringing the night’s grants total to £240,000 overall. The presentations were watched by a 350-strong audience, including embassy representatives, Whitley Fund for Nature donors and leading environmentalists. As part of the ceremony, The Princess Royal and other guests watched a series of short films showing finalists at work. The screenings included a film about Josia’s project , narrated by the distinguished wildlife broadcaster, Sir David Attenborough, a Trustee of WFN. The Whitley Awards scheme is an annual competition, first held in 1994. Since the scheme began, it has given grants worth more than £6m to support over 140 conservation leaders worldwide. To learn more about the charity, its donors, past winners, and how to apply for the 2013 awards scheme, please see: www.whitleyaward.org. Copyright-cleared photographs of each finalist and their projects can be accessed now from https://picasaweb.google.com/105548002819098368093. Photographs of winners receiving their Whitley Awards from HRH The Princess Royal will be available from the same site from about 2200hrs BST on 9 May. In addition, short films about each of the winning projects will be on Green TV soon after the ceremony ends. Lisel Alamilla (BELIZE) for a community empowerment and education project in the biodiversity-rich Maya Golden Landscape of Southern Belize. For more information: www.yaaxche.org /. Whitley Award donated by The William Brake Charitable Trust. Joanna Alfaro Shigueto (PERU) for her work to engage and involve coastal fishing communities in the conservation of several marine species, including turtles and seabirds. For more information: www.prodelphinus.org /. Whitley Award donated by Goldman Sachs. Ir ‘Budi’ Budiono (INDONESIA) for rallying local support in the wetlands of the Mahakam River to save his country’s last freshwater dolphins. For more information: www.ykrasi.110mb.com /. Whitley Award donated by WWF-UK. Inza Koné – IVORY COAST – for acting to secure a better future for people and wildlife in a last stronghold of West Africa’s three most endangered primates. For more information: www.rasapci.org /. Whitley Award donated by The Shears Foundation. Josia Razafindramanana – MADAGASCAR – for bringing sustainable benefits to local people while also protecting newly-discovered populations of endangered crowned sifaka lemurs. For more information: www.sifaka-conservation.org /. Whitley Award donated by The LJC Fund, in memory of Anthea and Lindsey Turner. Carlos Vasquez Almazan – GUATEMALA – for creating a network of ‘zero extinction’ zones for amphibians including an important new reserve. For more information: www.fundaeco.org.gt/. Whitley Award donated by Fondation Segré. Bernal Rodriguez Herrera – COSTA RICA – for reaching across national borders to co-ordinate conservation action for Central America’s rich array of bats. For more information see: www.tirimbina.org /. Whitley Award donated by The Garfield Weston Foundation.